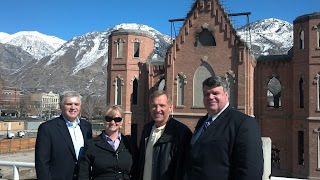 Members of the Council surveyed recent construction progress on the Provo Tabernacle reconstruction process Monday. Although the bricks still carry the sooty stains of the fire that consumed the building two years ago, the building reconstruction is well underway, and as mentioned in a previous post, on track for completion in 2015. 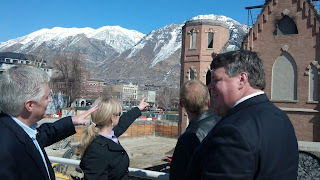 The reconstructed facade now seems to float delicately over the earth, but it’s actually poised on metal stilts that support the building while the basement is excavated. Provo residents are sure to see many more exciting construction mileposts as the construction process continues, and the building nears its completion date.